Hydraulic compression of swarf, scrap or metal waste to form briquettes for charging any kind of melting furnaces. A typical scenario is the dry machining of aluminum producing large amounts of swarf. The main purpose of briquetting in this context is volume reduction (figure 1). Another advantage arises during wet treatment of aluminum. Besides volume reduction, users can also reclaim the cooling lubricant bound in the swarf volume. Wet aluminum swarf may contain up to 25 weight percent of cooling lubricants. Pure aluminum or low aluminum alloys are usually easy to briquette. Low pressure of approx. 1,700 kg/cm² is sufficient for wrought alloys to produce solid briquettes. Density is slightly above 2.0 kg/dm³. If pressure is increased to approx. 3,700 kg/cm², briquette densities of up to 2.60 kg/dm³ can be achieved. With these types of applications, the volume of the raw material can be reduced by up to 20 times of the original volume, depending on the swarf form. 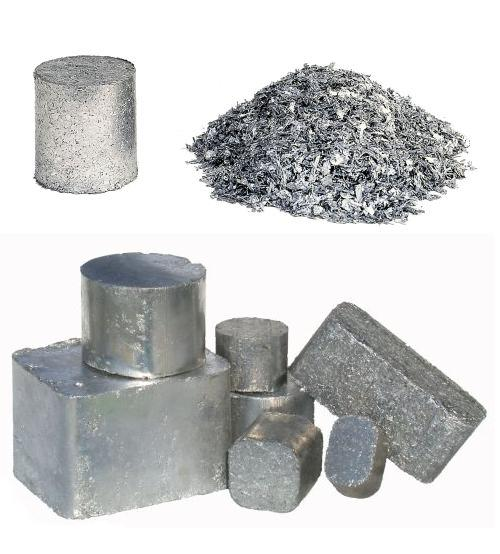 A greater challenge for briquetting machines (figure 2) is silicon-alloyed aluminum. The following applies to these cast alloys: the higher the Si content, the higher the required pressure. This effect is already true from a Si content of approx. 6%. Conventional cast alloys have a Si content of up to 12% (s. Aluminum gravity die casting alloys), in individual cases even up to 17%. 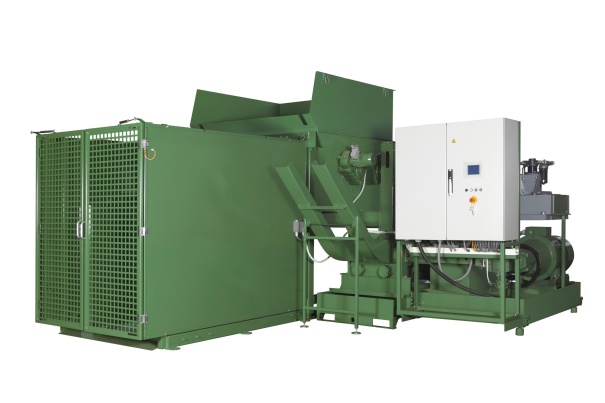 A pressure of 3,000 kg/cm² is required for the briquetting of this swarf in order to produce a solid briquette with a density of 2.0 kg/dm³ or higher. With this pressure or even higher pressure, briquette densities of 2.4 kg/dm³ and higher are possible.